At New Dimensions FCU we understand how busy life can be – so we offer a full suite of e-Services products to fit your mobile lifestyle. With New Dimensions FCU there is no need to write a check or go to the post office with Online Anytime Online Banking and Mobile Banking! Whether you are on your way home from your latest business trip or heading out on a family vacation, you have the freedom to access your money, anytime, anywhere! Online Anytime was tailored and designed with you in mind so that you would enjoy the convenience of “Google-like” searches, customized dashboards, and easy to read transaction histories. Additionally, with Online Anytime, you have the ability to update your personal information all from the convenience of your computer! As existing and new users, you are able to make transfers, schedule loan payments, get your statements online, and pay your bills with the Online Anytime Online Banking. You will log in to Online Anytime with your current username and password. Next, you will be prompted to select new security questions and answers as well as choose a security image and phrase. Upon completing this, simply type “YES” to accept the terms and agreements and then you are on your way! If you aren’t using our Online Anytime product now, no problem! Enrolling is quick, by clicking “Register” at the top of the home page, you will be asked for your account number, DOB, and last 4 of your social security number. You will then select a username and password, three security questions and answers, as well as a security image and phrase. Next, you will type “YES” to agree to the terms and conditions of the service and then you are all set to use Online Anytime! Remember to always be safe when using the internet. There are some precautions you can take to ensure your identity, as well as your personal information, remains private. For a quick “How to” guide to Remote Deposit Capture, visit here! All you need to take advantage of the New Dimensions FCU Mobile Banking app, is an active Online Anytime Account. If you already are using Online Anytime, just visit your app store and download the app, enter your username and password and then you are on your mobile way! For a quick “How to” guide to signing up for Home Banking, visit here! For iPhone users, click here to download our app. For Android users, click here to download our app. If you aren’t using Online Anytime yet, enrolling is easy. Click Here and the system will direct you how to register! *Standard message and data rates from your carrier apply. Sign up for the freedom of Online Bill Pay at NDFCU! To get started, simply stop by any of our branch locations, contact us at (800) 326-6190, or log in to your online banking account at https://ndfcu.cuview.net/User/AccessSignin/Start and select the Bill Pay tab located at the top of the page to access the enrollment form. You must have a checking account to utilize Online Bill Pay! Simplify your life, today, by signing up for Online Bill Pay. Whether you are paying in a store or within apps, you can pay with just a touch of your finger or by simply looking at your phone on your supported Apple® device. To pay, just hold your compatible phone (iPhone® 6 or newer) near the contactless reader with your finger on Touch ID or double-click the lock button with Face ID. A subtle vibration and beep lets you know the payment was successful. In apps, tap the “Buy with Apple Pay” button, verify your information, and then place your finger on Touch ID, or look at your phone with Face ID to complete the purchase. You can pay anywhere Apple Pay contactless payments are accepted. You can also make purchases within participating apps on compatible devices listed here* with more stores and apps to come. Apple, the Apple logo, iPhone, and iPad are trademarks of Apple Inc., registered in the U.S. and other countries. Apple Pay, Touch ID and Face ID are trademarks of Apple Inc. Whether you are paying in-store or in-app, you can pay with just a tap on your supported Android® device (KitKat 4.4 and higher). Forget fumbling through your wallet and handing over a card next time you’re in a store. With Google Pay, you can simply unlock your phone, place it near a contactless terminal, and you’re good to go. You don’t even need to open an app. Tap and pay is that fast, that easy. 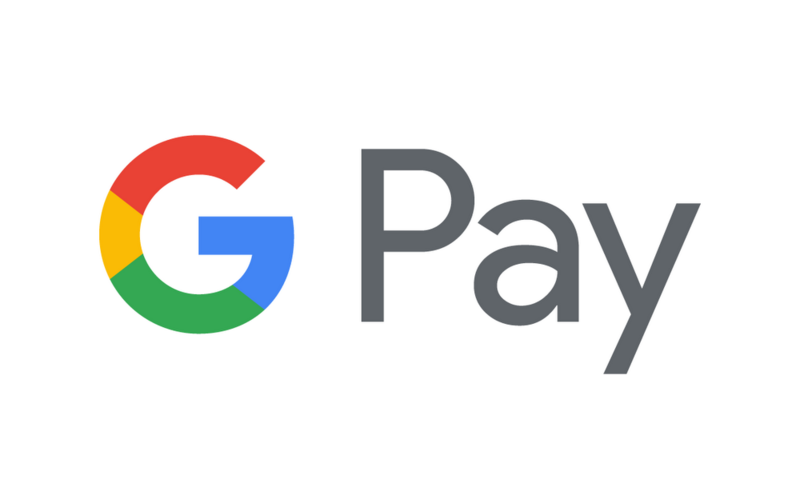 Google Pay is accepted at over 2 million stores across the U.S. and is now available in your favorite Android apps. And more are being added every day. Look for one of these symbols at checkout or view participating merchants here*.